What’s the best gateway board game in the world? Is it Settlers of Catan from Mayfair Games? Or is it Ticket to Ride from Days of Wonder? Or we can make it short in Ticket to Ride vs Settlers of Catan? What is that for? We put those title on this article in order to find out everything especially the difference or what kind factor that affect people to choose either Ticket to Ride or Settlers of Catan. Directly go on the following below! Ticket to Ride is a game providing players with intense strategic and tactical options every turn they have, and give it considerable replay value too. For making a good start, each player is given 3 goal cards and each goal card lists two favorite cities that player will try to connect with. At least, there are two or three goal cards player must have so that at the end of game, they can get positive points if successfully connected the cities. You will get negative points if you have not in longer routes. The longer the routes, the more points they earn. Additional points come to those who fulfill Destination Tickets. This game contains 2 to 5 players that played for ages 8 and up. The time remaining to play it is just for 30 or 60 minutes. One packaging of Ticket to Ride comes with 240 plastic train cars, 144 cards, five wooden scoring markers, and the game board. It is really a great game especially for families and for gamers as well. This is also a variety of paths can lead to victory and moreover, wonderful game components, including plastic trains and gorgeous board. Unfortunately, some players find the possible point swings to be too dramatic about this game actually. Settlers of Catan is what board game enthusiasts call a German-style game. In fact, given its worldwide popularity, Catan has become the epitome of German game mechanics that favor nonviolence, cooperation and invigorative thinking. Settlers of Catan let players try to be the dominant force on the island of Catan by building settlements, cities, and roads. The dice will throw as a role rule to determine what resources the island produces. The resources that must be collected to players are wood, grain, brick, sheep, or stone for building up their civilizations to get up to 10 victory points and become the winner of this game. It is placed in large hexagonal tiles in honeycomb shape and surrounded by water tiles, while the dice is placed on each resource tile. First of all, players is given 2 settlements and roads to place in intersections and borders of the resource tiles. Players must collect a hand of resource cards according to which hex tiles their latest placed house was adjacent to. One turn consists of possibly playing a development card, rolling the dice, and probably all of them can collect resource cards based on the roll as well as the position of houses unless a 7 is rolled, turning in resource cards for improvements only, trading cards at a port, and trading again resource cards with other players. 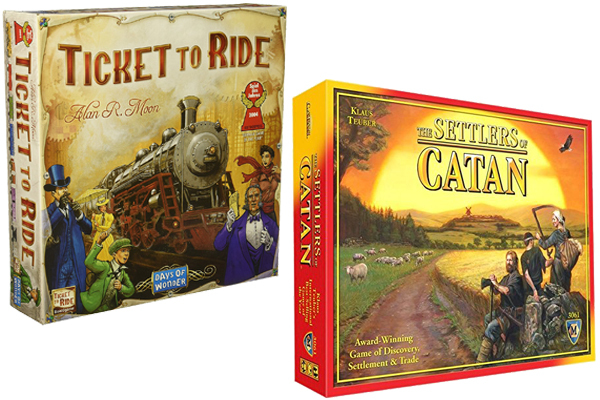 They are (Ticket to Ride vs Settlers of Catan) both really good games that are known for being very casual-friendly and introduction to board gaming. Ticket to ride can be played with 2-5 players, While Settle of Catan are limited for only 3 to 4 players. In the conclusion, we think that you can not really go wrong with either. It is like a kind of depends on who you are playing it with as to what kind of games you will really enjoy more and more.